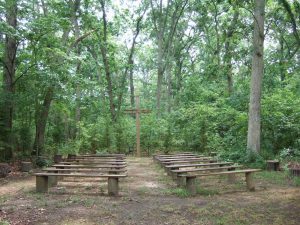 In 2006 our talented volunteers constructed an outdoor chapel. Rev. Thomas Fisher and Ed Rhubart discussed the need for such an area. Their inspiration came from an outdoor chapel they had admired at Delanco Camp. The seating will accommodate nearly 80 worshippers and is a hidden treasure located off the path to the ball field behind the Skinner Cottage. Terry Mitchell a member of the Petersburg Methodist Church handcrafted a sturdy cross that defines the reverence and tranquility felt while seated quietly. Ed Dietz, owner of a local masonry company, donated his labor, expertise and all the piling for the benches. Our camp’s history reveals that prayer was and continues to be the foundation that brings purpose to a wooded grove in South Seaville, New Jersey. At the first camp meeting, the religious activities were held in the open under a canopy of leafy oak trees. People sat on wooden benches. Pews consisted of backless planks nailed to posts in the ground. Facing this seating area was the pavilion, a sheltered, elevated platform for the speakers and musicians. Completed in 1883, the hallmark of our camp was the Prayer Meeting Tabernacle. It was an open structure with a gable roof. In 1890 the directors discussed constructing an auditorium. It was concluded, instead of constructing a new building, the Prayer Meeting Tabernacle should be moved in front of the pavilion and enlarged. A temporary stand for the preachers was built prior to the first year’s encampment in 1875 on the permanent grounds. Nicholas and Youngs Corson, the lowest bidders were awarded the contract for building the permanent structure for the cost of $497. In 1877 the completion was marked with a dedicatihttps://southseavillecampmeeting.org/wp-content/uploads/2014/05/garden.jpg. The Prayer Garden pictured in the above movie is located near the front entrance of camp meeting on Dennisville Road. Working toward obtaining his Eagle Scout Distinction, Drew Baldwin, cottager, designed and constructed this memorial garden in honor of William Folk.The plaque reads – Friend, Scouter and Cottager. Folk is Baldwin’s great uncle. There are plantings, flagpoles for the American and Christian flags and two permanent benches. Their families donated these in memory of Rev. and Mrs. John Long and Rev. and Mrs. Larry Moore. Drew maintains this area so all cottagers have this special area to enjoy.